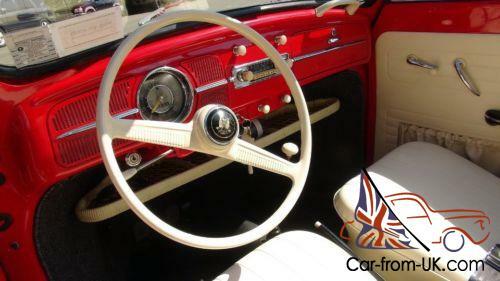 Bring back the nostalgic memories of the 50s! If this one does not suit you. we have others. Cmon! Get in a Bug. 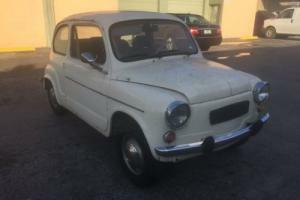 it's Your chance to own the first "People's Car. quot; a piece of History. Description: BODY CHASSIS MATCH. Period Correct 36hp Motor. OK! Lets get BuGGin shall we?? 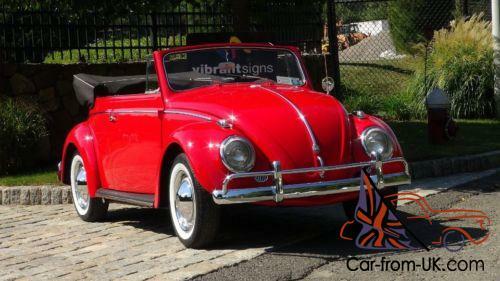 Up for sale is a 1958 VW Beetle Convertible in the classic red white combo. Car was restored around 10-15 years ago and has treated us well. The paint job on this convertible is a high end driver quality. it shows some age when you get up close. I would honestly say it's a 5 footer. she looks great. Paint shines brilliantly in the sun. we take it to shows all the time and the folks love it. PLEASE look at all the pics in this auction. We bought this bug out of West Point from an Army Major that has owned the car for about 5 years. Everything is here for you. many many pics are in a Full Photo Album HERE. 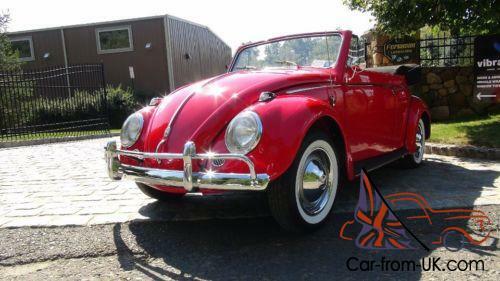 Convertible Beetles are some of the most sought after bugs on the market. 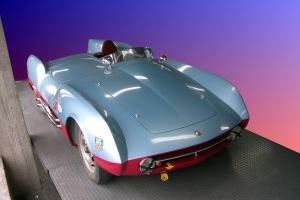 especially the 50s verts with production numbers so low. anywhere between 4000-5000 were produced in this year world wide. not many. 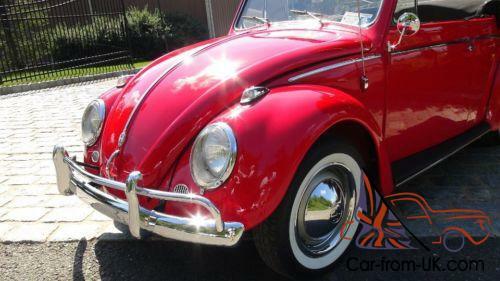 The Beetle still sports the old 6v system and starts with the flick of the key. Doors open and close effortlessly on this vert. this is one area where convertibles can suffer over time. and the lines are perfect on this one. The bug has a solid underbelly. take a look at the pics I provided. the chrome around all windows has been redone. and the convertible top frame has been powder coated. 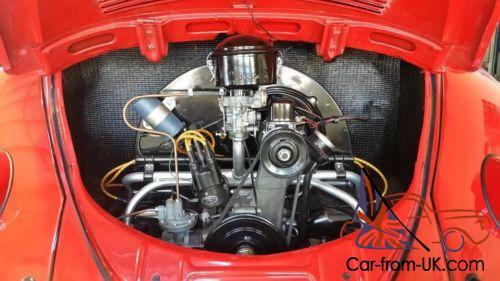 - The rebuilt original style 1192cc 36hp engine installed. that magical German Abarth sound purrs in all its glory. She runs perfect down the road with no shimmies. shakes or Hiccups. We found this motor for the car that falls within 2 months from the birth of the car. - Fresh oil. full tune up. ready to roll. - New Points. cap. rotor. wires. plugs. and all valves adjusted as well. U NAME IT! 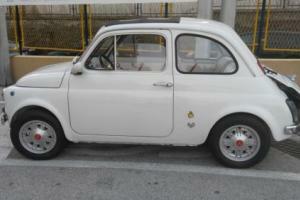 This classic is in high end driver/show condition with a paint job from the last 10-15 years. 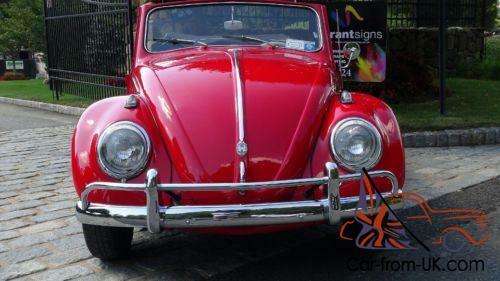 A show bug that will draw attention everywhere you go. but also capable of being driven and not so afraid to take it places. Tootle around town or show her at a cruise night. this car will only appreciate in value! This car has been driven to and from car shows two to three hours at a time. I would not hesitate to drive her to Cali from NY. After every drive she is stored in a climate controlled environment. The original body and chassis are incredibly dry. all panels. floors. fenders. hood. decklid. rockers. and doors are rot free. 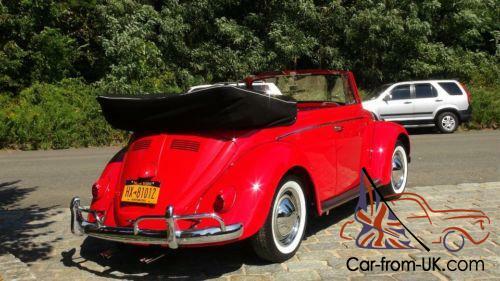 There are not many 50s convertibles for sale on the market today. and I feel this is one of the cleanest. - Found the correct 36hp Motor. rebuilt and detailed for show standard. - New White Walls. new hubs and trim rings. - Solid heater channels/rockers and pans. 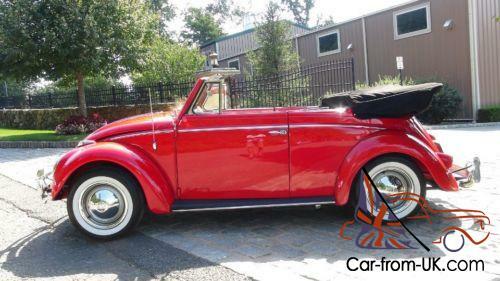 All new interior was installed into the gut of this car to give it that ole Vintage Bug Flare! Correct floor mats. and TMI Convertible Carpet kit. Any questions call me 845. 290. 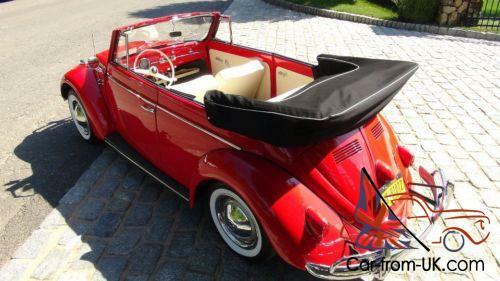 9900 This is A magical 1958 Bug Vert!. The body is structurally sound. see for yourself. Drive her home and enjoy. 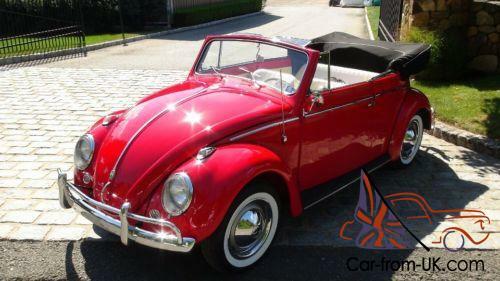 This is a great example of a Vintage Bug. TURNKEY AND READY TO ROLL TO SHOWS. What more can you ask for? It's all here. A Great Classic Ready for a show. Additional info HERE along with a Video from the day we picked it up. 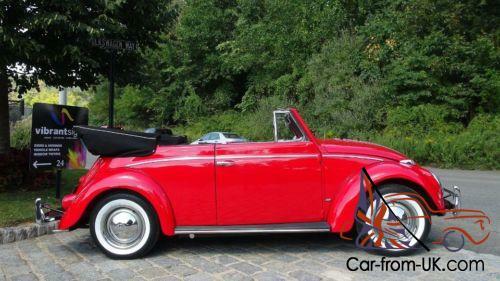 Whoever decides to own this bug is getting a stunning Classic automobile. It is a fantastic investment. Split bugs are always appreciating in value! And of course a great Gift. Please come see it in person if you can. SHIPPING: It is your responsibility to pay for shipping. Car is sold as is no warranty. All Sales are FINAL. I have described the Vehicle above to the best of my ability. Some conditions and possible uses are a matter of opinion. If you need more clarification. 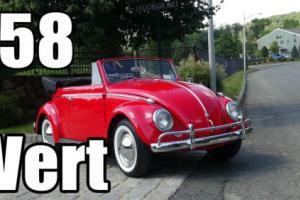 email me at chris@classicvwbugs. com or call 845. 7290. 9900. Please understand. these cars are not BRAND NEW. they are 40+ years old and unlike cars today they will need general maintenance and TLC. I reserve the right to end this auction EARLY if need be. 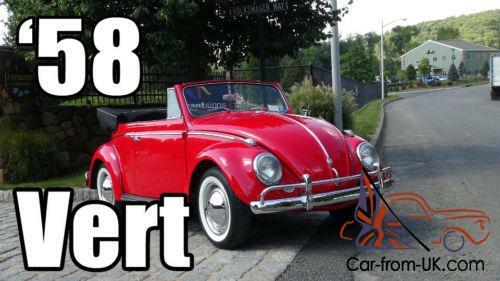 the bug is also for sale on my site and in my local area. We accept payments via Paypal. If you don't have paypal. you can set up an account easily at www. PayPal. com. It's free. secure. and only takes a couple minutes. 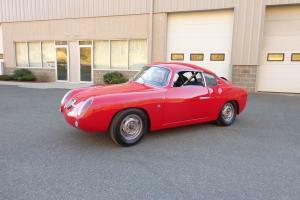 1959 Abarth 750 Zagato. Double bubble.